Jones, the founder and CEO of research organization PRRI and author of The End of White Christian America, spoke at Alice Millar Chapel Tuesday about the political ramifications of demographic and ideological changes in America today, specifically focusing on white Christians. One Book One Northwestern invited Jones to speak due to the data-heavy content of his presentation and of his work in general, which relate to Nate Silver’s The Signal and the Noise, a book about polls, data and interpreting information. Throughout his presentation, Jones was sure to emphasize that Donald Trump’s presidential win was the result of small shifts and “razor thin margins,” presenting data on the margins of victory of Trump’s wins in key states and the historical placing of his electoral win. Jones supported this idea with a number of charts depicting demographic, ideological and religious trends. This included looking at where Democratic and Republican support is coming from. The shrinking pool that Jones referred to is white Evangelical Christians, a group he focused on when discussing the context of Trump’s victory. “One of the surprises of the election is white Evangelical support for Donald Trump,” Jones said. The reason for this surprise, Jones explained, was that the values and morals that had driven these voters in past elections were replaced by a desire to “turn back the clock,” citing research that showed white Evangelical voters have become more accepting of politicians’ personal indiscretions. “He had converted these value voters into what I call ‘nostalgia voters,’” Jones said. Jones discussed how young people are changing America’s religious landscape, with more and more younger Americans identifying as religiously unaffiliated. Cultural factors, especially LGBTQ rights, play a sizable role in this exodus of young people from Christianity, Jones explained. These young Americans also tend to have more liberal views than older generations, something that Jones said won’t be going away anytime soon. Jones emphasized “the two competing visions of the country” on either side of the ideological aisle – the Republican vision of reviving the past, and the Democratic vision looking to the future. “At the end of the day, there’s going to be no choice but acceptance of the changing cultural landscape,” Jones said. 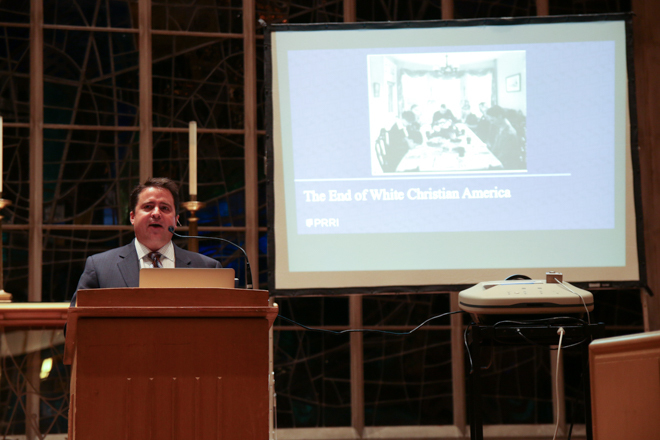 After the presentation, Jones responded to questions from the audience on a range of topics, including how simple surveys depict broader trends, division within American Christianity and how Americans view whiteness. In response to a question about where the Republican Party can go from here now that its base is so heavily defined by white Christian Americans, Jones described the instability of relying on this base. “The power of this world has died,” Jones said – “this world” being white Christianity in America. Weinberg senior Jessica Yang found Jones’ emphasis on shifts in demographics and religious beliefs to be especially thought-provoking. Jones picked out an excerpt from his book to read, in which he gave a mock obituary of white Christian America, to help contextualize his presentation. “After a long lifespan of nearly 240 years, white Christian America, a prominent cultural force in the nation’s history, has died,” Jones said.